This four wheel track inspection bicycle, or pedicycle, was manufactured by the Light Inspection Car Company of Hagerstown, Indiana. It was used for many years by V&T employee Enrico Giuffra, and also by his wife, Clara on trips to town for family supplies. 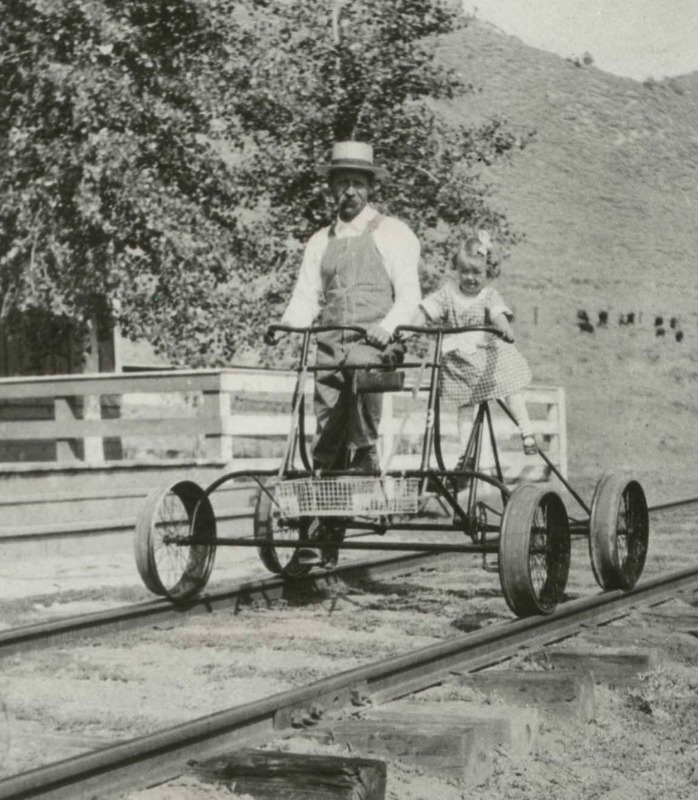 It is typical of the light track vehicles used by railroad maintenance workers and officials in the early part of the 20th century. The Giuffra family of Virginia City donated this track bike to the Nevada State Railroad Museum. Enrico Giuffra came to the United States in 1909 from a small town near Genoa, Italy. His wife Clara followed several Months later. They first lived at Lakeview where Enrico worked for the V&T. Their first child, Albert, was born here in 1910. Later, they moved to the Scales section foreman's house near American Flat where John, their second child, was born in 1911. It was from this place that Clara Giuffra, with baby Albert safely sitting in the track bike's wire basket, pedaled up the long grade to Gold Hill for groceries and to pick up mail and packages. The Giuffras later resided in a house over looking the V&T's engine house in Virginia City where their third child, Inez, was born. Both John and his son Albert worked for the V&T in various capacities ‑ from snow removal to the demolition of the high trestle over the Crown Point Ravine. In addition to maintaining the track in tip‑top shape, Enrico was an "expert" at piloting the V&T's flanger car while clearing snow and ice from the line. To him it was more of an instinct to know when to raise the blade at crossings and switches, despite. their being covered with several feet of snow. In 1939 Enrico retired as section foreman of the Virginia City branch. To perpetuate his name and that of his wife Clara, the family donated this rare memento of bygone days.